As soon as I saw Sarai’s striped Mabel I knew I needed one in my wardrobe. After a bit of fabric hunting and some deep thought about too-thin ponte knits here’s what I came up with. 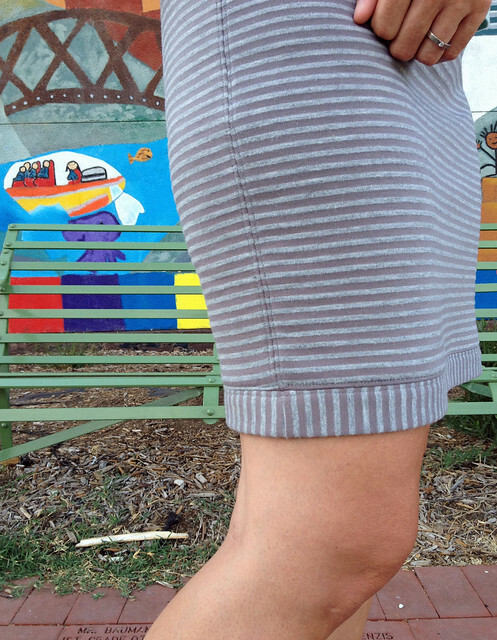 Love the contrast stripes on the waistband and hem band. Although this fabric looks lovely and is very soft, it is also too thin. (One of the dangers of online fabric shopping.) I wanted the fabric to be substantial enough to skim over curves instead of showing lumps and bumps. I don’t have any experience lining knits so I decided to do some experimenting and make some more Mabels! After some internet searching I decided to try a double layer of ponte fabric. And I decided to top stitch the seams to make them lie flat and because it’s a nice design element. Love the way this turned out. The seams lie very flat and neat and the weight of the skirt is really nice and not too heavy. In fact, this is my favorite Mabel so far. Extra points because it’s great with my Scout Tee. I also tried out a knit tricot lining on a different Mabel. This was easy to sew but didn’t do much to add to the weight of the fabric and also makes the skirt move around a lot when I walk – it has a tendency to turn around and ride up. Not great for this skirt but might work well for lining a knit dress to be worn over tights so I’ll keep it in mind for future projects. This looks great!! I am about to start a Mabel with pretty thin fabric and was looking around for examples with a full lining — this is exactly what I was looking for. Great work! Thanks! This is my favorite kind of comment. Good luck with your Mabel!